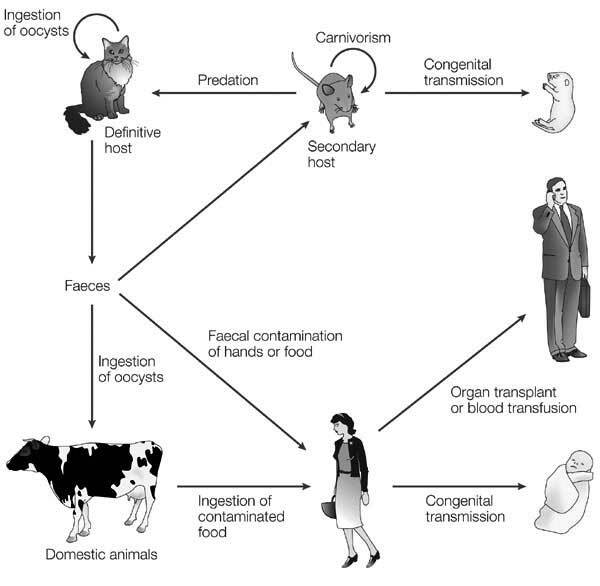 Toxoplasmosis is a parasitic infection transmitted to humans and other warm-blooded animals from feces of infected cats or through undercooked meat. Toxoplasmosis is very dangerous during pregnancy as a pregnant woman can transmit the parasite to the fetus and cause serious damage. Toxoplasmosis is caused by a parasite, Toxoplasma gondii, which was first discovered in 1908. Around one-third of the world population carries Toxoplasma gondii, making it one of the most common protozoan parasites. Toxoplasmosis is one of the leading causes of death attributed to food-borne illness. The primary host of T. gondii are cats (both wild and domesticated). The parasite usually reproduces in cats but can also reproduce in any warm-blooded animals including humans. 1. Ingestion of cat feces containing Toxoplasma oocysts. This can happen through hand-to-mouth contact following gardening without gloves or cleaning a cat box. Depending on the condition, the oocysts can persist for quite some time in the soil. 2. Ingestion of undercooked meat. The oocysts can also be ingested through hand-to-mouth contact after handling an infected meat, or from using kitchen utensils contaminated by raw meat. Cats can acquire T. gondii by eating raw or undercooked meat, infected prey, or when they come in contact with contaminated cat feces or soil. The less your cats roam outdoors or eats undercooked meat, the lower the chance that they'll become infected. Healthy adults who become infected usually do not experience any symptoms as their immune system is working against the parasite. Around 10% to 20% of patients develop influenza-like symptoms, muscle aches, and other minor symptoms, which last for several weeks. The T. gondii remain in the body as tissue cysts and will reactivate if the person becomes immunosuppressed (such as HIV-infected patients) or those taking immunosuppressive drugs. You may have heard that pregnant women should avoid contact or cleaning of cat litter boxes. This is very true since the infection can be passed on to the developing fetus, resulting in premature birth, miscarriage, or serious health defects on the unborn child. NOTE: If a woman has been infected before becoming pregnant (about 6-9 months before conception), usually, the mother develop immunity and the unborn baby will be safe. Your chance of contracting toxoplasmosis is greater if you are recently recovering from surgery or from serious illness, have had organ transplants, or currently undergoing chemotherapy. These things weaken your immune system, making it difficult for your body to fight the infection. Observe proper hygiene and wash your hands frequently. Never eat undercooked or raw meat. Make sure that all your kitchen utensils are clean before preparing foods. Use gloves when gardening or when cleaning the cat's litter box. Don't feed your cat with raw or undercooked meat. Don't let your cat roam outdoors.